Mornings in my house usually go like this: N. wakes up at five thirty and stands with her nose hung over the gate at her door, shrilling "MOM! momEEE! MOM! momEEEE! mooOOOOoom!" This means: "come get me out of this prison, please don't change my diaper because I hate that, and give me my sippy cup of milk STAT." So I roll out of bed, oblige her (except for the diaper part, because as we all know I am the Cruelest Mom in the Universe), and begin to make breakfast while I get lunch together for my son to take to school or camp. I. comes down at around six, and climbs up onto the kitchen stool with a surly scowl. If I have, by some bizarre chance, not yet poured a glass of milk for him, because I was oh, I don't know ... doing TEN other things? he snarls, "Where's My MILK?" Yep, I just can't wait to wake him up for high school. I dish out whatever fruit we happen to have on hand (N. demanding "Tay? Tay?" meaning "Excuse me? Put the fruit on my TRAY! NOW!") while I'm finishing up lunch preparation, and then I. is on his own to find the rest of his breakfast, because I'm on N.-meal-supervision duty. Though I often need to run through the list of options, usually, he's pretty good about this: he rummages through the cabinets to find cereal or granola bars, is capable of toasting himself a waffle, climbs up on top of the stools to reach condiments while giving me heart palpitations, and has even, on rare occasions, made French toast with minimal assistance. Yesterday, when I asked him what else he was going to have for breakfast after he finished his bowl of canteloupe, he looked me square in the eye, crossed his arms, and whined dramatically, "MOM, there is NOTHING here to EAT. I'm BORED with this food." I laughed, told him that we had all kinds of things to eat, and he needed to choose one, and continued with the morning routine. He grumped for about two minutes, and then poured himself a bowl of Life. But because like my surrogate Jewish mothers I am very sensitive about the issue of having enough tasty things around the house for people to eat, it nagged at me all morning, until finally I decided to do something about it and make cinnamon buns. My husband is the bread baker in our house, but it would probably never occur to him to make cinnamon buns, because for him, bread is a straightfoward if variable affair involving yeast, flour, water, salt, sweetener for yeast food, and heat. It never would have occurred to me, either, except that I was going too slowly in the refrigerated dough section of our grocery store last week, saw cinnamon rolls there, and felt nostalgic for Talkeetna. In 1996, the summer after my first year in graduate school, my father got it into his head that I should take a vacation. I was living alone in LA at the time, and had been traveling up and down the West Coast to visit friends in Berkeley and San Diego, drinking in as much of the Pacific as I could, but I hadn't yet ventured too far north. My father, in his infinite wisdom, declared that I should go to Alaska. And, despite my insistent refusal, that he would pay for it. It was settled. I planned the entire trip online, in the still-early days of the internet, when first generation web pages were still the standard currency, before Twitter and Facebook, so everything was sight unseen. I would fly to Anchorage, rent a car, drive to Seward, then backtrack north to Talkeetna, finishing in Wasilla (I had to laugh that I actually knew where Wasilla was during the last presidential campaign) and back in Anchorage. I made reservations at B&Bs in town at all of these places, so I could walk where I needed to. Except for Talkeetna, where there was no B&B in town. And when I drove into Talkeetna in my rented compact, and parked at the Fairview Inn, where I'd reserved a private room, I started to worry. You see, the Fairview was a bar. Is a bar. A historic bar, a lovely bar, perhaps, but a bar nonetheless. In Alaska. Where the town bar is just about the only entertainment in town at night. If you've never slept in a room locked with a hook and eye closure above an Alaskan bar, well ... let's just say it's a unique experience. You survey the situation. You decide that it's in your best interest to get to know the locals before you go to bed. You order a Diet Coke, because you don't dare order a beer. You strike up a conversation with a mountain man and pilot who hands you his business card: it reads--I kid you not, look him up--Trigger Twigg. You notice that people carry weapons instead of handbags. You retire early, and you carefully lock your little hook and eye closure, inspecting the door frame, which is ... historic. I spent most of the night sitting up in my bed, listening to the raucous laughter downstairs, wondering if one of the locals might, in their excitement, come beat down my door. I survived, but the next morning I moved to the Talkeetna Roadhouse. I'd originally been hesitant to go there because it was more like a hostel, with multiple bunks, but it was the only other option in town, and for a woman traveling alone, it seemed like a better choice. It turned out that the bunk room was empty anyway, so I got my privacy. I bolted the door that night, slept like a baby, and in the morning, I woke up to the incredible smell of baking cinnamon buns. I think I wept for pure joy when I arrived downstairs. I curled up on the couch with a book from their chockfull built ins, and dug into a dinner plate-sized fresh cinnamon bun with a vat of coffee to wash it down. It was, quite possibly, the second best breakfast I'd ever eaten. I set to work during N's always-too-short afternoon nap, mixing the ingredients for the dough, setting it to rise, making the filling. By then N. was awake, and I peeked at the dough, which wasn't rising. I realized I'd set it on the cold countertop, which wasn't warm from the sun as it usually is, and moved it closer to the stove. After a little while longer I decided I couldn't wait, and attempted to roll out dough while she pulled on my leg: "SEE? SEE? roll, roll. Roll, roll." They smelled fabulous while they were baking. They looked fabulous when they were done. And smeared with icing? I was determined that my son, too, would weep for joy when he arrived downstairs for breakfast. Unfortunately, this morning, he decided that he didn't want cinnamon buns, either. Madness, I tell you. Can't win then all, I guess. More for me. Here's looking at you, Talkeetna. I still remember you fondly. 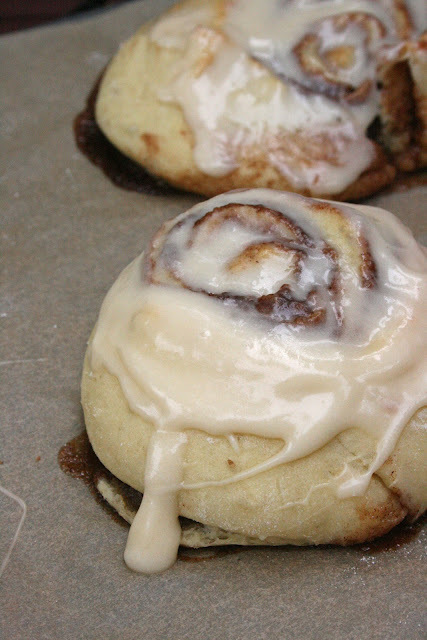 Maybe if you read this, you'll send me your recipe for cinnamon buns. I promise I'll guard it with my life. What was the best breakfast you ever ate? Adapted from here. I halved the recipe and it still made eight ... though I suppose if you want to make them Alaskan size, like the Talkeetna Roadhouse did, you could get twelve from the full recipe. Or eight, but that might be a little crazy. Dissolve the yeast in the warm milk in a large bowl. Add sugar, butter, salt, eggs and flour. Mix well. Knead the dough into a large ball, using your hands dusted lightly with flour, and adding flour a little at a time if the dough is too sticky. Put in a bowl, cover and let rise in a warm place (not the countertop, like I did!) about 1 hour or until the dough had doubled in size. Roll the dough out on a lightly floured surface, until it is approximately 21 inches long by 16 inches wide and 1/4-inch thick. Combine the brown sugar and cinnamon in a bowl. Spread the melted butter over the surface of the dough, then sprinkle the brown sugar and cinnamon mixture evenly over the surface. Working carefully from the long edge, roll the dough down to the bottom edge. Cut the dough into 1 3/4-inch slices, and place on parchment on baking sheet (or in a baking pan if you don't like your rolls "free form"). Bake for 10 minutes or until light golden brown. To make icing: While the rolls are baking, combine 8 T. butter with cream cheese. Beat well with an electric mixer until fluffy. Add sugar, vanilla, and salt, and beat again until the mixture becomes spreadable. When the rolls are cooled, spread with icing. You can keep these in the refrigerator and warm them up the next day in the microwave for about 15 seconds. Can I come to your house for breakfast? Yum-O! I can't believe your kids get up that early! I have to drag mine out at 7:30/8! And, that trip to Alaska sounds awesome and your dad even more so for insisting that you go! As for the best breakfast...hmmm: I'm thinking this small vegan restaurant in New Zealand that made this ridiculously good egg substitue/tofu scramble that was healthy and delish, which was surprisingly hard to find on the South Island. Or.....this great diner in Big Sur that introduced me to whole grain oatmeal in my mid-20s. Yum. Thanks for the memories! I don't know if it's my best breakfast, but there's one memorable that came to mind. I'm surprised I still remember it. It was a brisk fall morning, and I was probably 6 years old. My doctor, who lived down the road, had enlisted the help of 5-6 locals to help him split wood for the winter. I got invited too -- sans parents -- it was my job to move the lever back and forth which controlled a hydraulic log splitter, while the grown men sawed tree trunks, swung axes, and put logs on the splitter. We worked for a few hours, with a sizeable pile of firewood to show for it. Then we all went inside together to a breakfast cooked by the doctor's wife. All the weekend lumberjacks sat around the table, and I with them. The meal was a standard "mountain man" breakfast -- eggs, potatoes, bacon, and testosterone. Everyone sat around, telling stories, laughing heartily while we ate. I sat with them and I was one of them. I had never felt so grown up. HE DIDN'T WANT THE CINNAMON BUNS!?!?!?! AHHHHHHHH! I am impressed (read: jealous) that you always have all the ingredients on hand to just whip up whatever strikes your fancy! Cinnamon Buns are my favorite and yours look incredible! I love the story that goes along with them and I can't believe your son didn't want them. I don't think he realizes what he's missing. Before moving to this part of the world I spent a lot of time in Mexico and I always looked forward to either huevos a la mexicana or chiliquilos for breakfast. Unfortunately there is not a lot of Mexican food here. I can recreate the huevos pretty well but not the chiliquilos. Some years back, my husband and I spent the night in New York for some occasion or another and, in the morning, we happened upon the Brooklyn Diner for breakfast. He got pancakes and I got some kind of omelet. Of course, his food looked far better than mine and, in fact, those pancakes were divine. My oldest was going through a mighty pancake phase this past year and I was hoping to take her in to the city to enjoy those same pancakes. Still working on that. 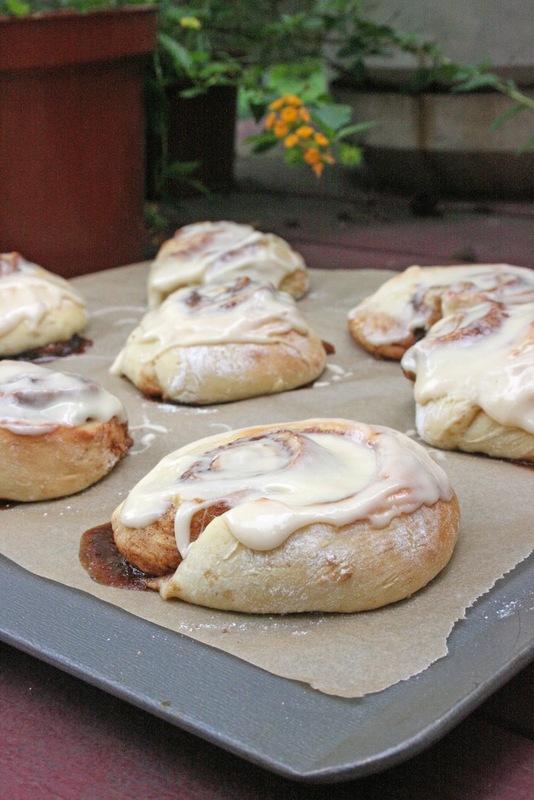 In the meantime, I think I'll make some cinnamon buns! There you go making me drool on my keyboard again! Now there are 2 parties I will be attending. Ice cream and cinnamon bun socials! I think I saw that place on the food network or man vs food or something with the huge cinnamon buns, pancakes and other stuff! Oh, my. Have you got my salivary glands working double-time. Me, too on this: "I just can't wait to wake him up for high school." You were very brave to take that vacation alone like that -- funny stories! We just tried this recipe - delicious! I didn't have cream cheese so I made a different icing but they were incredible. Thanks for sharing it! This post made me smile. I too have experienced walking down the creaky stairs of the Talkeetna Roadhouse, to the sweet smell of the bakery, and the warm environment of the dining room full of stories and laughing. I can't wait to try this recipe!